The Stop & Start system puts the engine temporarily on standby - STOP mode - during stops in the traffic (red lights, traffic jams, or other...). The engine restarts automatically - START mode - as soon as you want to move off. The restart takes place instantly, quickly and silently. - with the 6-speed electronic gear control gearbox , at a speed below 5 mph (8 km/h), when you press the brake pedal or put the gear lever into position N .
If your vehicle is fitted with the system, a time counter calculates the sum of the periods in STOP mode during a journey. It rests itself to zero every time the ignition is switched on with the key. With the automatic gearbox system, for your comfort during parking manoeuvres, STOP mode is not available for a few seconds after coming out of reverse gear. 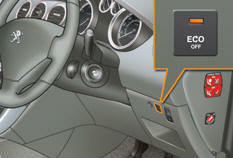 STOP mode does not affect the functionality of the vehicle, such as braking, power steering, for example. In this case, the "ECO" warning lamp fl ashes for a few seconds, then goes off. ● or when you engage reverse gear. With a manual gearbox in STOP mode, if a gear is engaged without fully depressing the clutch pedal, a warning lamp comes on or a message is displayed asking you to depress the clutch pedal to restart the engine. In this case the "ECO" warning lamp fl ashes for few seconds, then goes off. The system is active again; this is confirmed by the switch warning lamp going off and a message in the instrument panel. In the event of a malfunction with the system, the "ECO OFF" switch warning lamp fl ashes, then comes on continuously. In the event of a fault in STOP mode, the vehicle may stall. All of the warning lamps in the instrument panel come on. It is then necessary to switch off the ignition and start the engine again using the key. Before working under the bonnet, deactivate the Stop & Start system to avoid any risk of injury resulting from automatic operation of START mode. This system requires a specific battery with a special specification and technology (reference numbers available from a PEUGEOT dealer or a qualified workshop). The Stop & Start system makes use of advanced technology. All work on this type of battery must be done only by a PEUGEOT dealer or a qualified workshop.